Vegetable Pulao: Vegetable Pulao or Vegetable Pulav is a spicy rice dish prepared by cooking rice with different vegetables and spices. Various spices, vegetables and rice are initially sauteed in oil or ghee and after that cooked in pressure cooker as you would cook plain rice. In any case, the uniqueness of this simple blended vegetable pulao lies in the use of bay leaf, cinnamon and cloves which gives a complex sweet-smelling feel that essentially makes juices flowing in the mouth. Rinse the rice till the water runs clear of starch. In a deep thick bottomed pot or pan, melt ghee on medium heat. Saute the onions till golden, on a low flame and stir often for uniform browning. Add the ginger-garlic paste slit chillies. Saute for 10 to 12 seconds. Saute for 2-3 minutes on a low flame. Add in all the veggies and saute again for 2-3 minutes on a low flame. Saute gently for 2 minutes on a low flame, so that the rice gets well coated with the oil. Add in the water/vegetable stock. Sprinkle the lime juice and season with salt. Cover tightly and let the rice cook on a low flame, till the water is absorbed and the rice is well cooked. Note: Check in between a few times to check if the water is enough; depending on the quality of rice, you may need to add less or more water. Use fork to gently stir the rice without breaking the rice grains. Once the rice is cooked, fluff and let the rice stand for 5 minutes. Vegetable Pulav is ready to be served. Serve the vegetable pulao hot with some side salad, sliced onion & lemon wedges or raita. 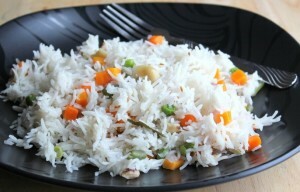 If you have any queries regarding the Vegetable Pulao recipe, please leave a comment.